Three tiers provide ample storage for those extra items in your kitchen. Perfect size to slip next to every gap, where there is a slit, then you can put it there. The package contains only the product and does not contain any decoration items involved in the picture. Material: PP (high temperature resistant and good durability). Safe for the home. 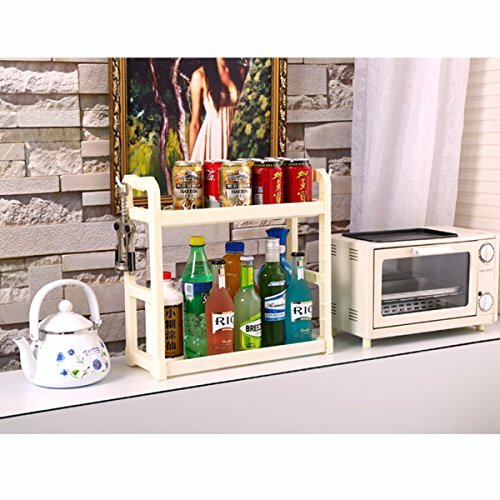 Make use of the space, fit in the crevice gap of the kitchen, bathroom, laundry room or garage, living room, bedroom, etc. Solve your storage problems. Helps to keep everything organized in a relaxed way. PP material made, double hollow design, kitchen, living room, bathroom, study can be used, table top clean and clean desktop. Easy to assemble no tools require. If you have any questions about this product by KINGSUNG, contact us by completing and submitting the form below. If you are looking for a specif part number, please include it with your message.